Many numbers about Kansas public education finance are flying. It can all seem confusing and complicated. 1) Kansas classrooms have been hurt. 2) Under current policies, the future will be worse. If you want to dig deeper into what’s happened with school finance, carefully read Mark Tallman’s excellent blog post: "Facts about Kansas school funding: up, down or flat?" Tallman — Associate Executive Director of the Kansas Association of School Boards — helps readers understand how the various components of school finance add up. The key chart from his post is shown below. School district funding that can be used for classrooms and educational programs has been declining. At the same time, the total number of students statewide has been going up, leading to increased classroom sizes and diminished educational opportunities for each child. The trend in the chart corresponds to the per pupil funding decline in the Kansas school finance formula from $4,400 per pupil six years ago to $3,852 this school year — and the reduction in state appropriations for General State Aid from $2.175 billion in FY 2009 to $2.030 billion in FY 2015. 1) Kansas classrooms have been hurt. The governor and a slim majority of legislators have chosen a path that has reduced the resources going to classrooms. School districts have received new dollars to cover costs of the Kansas Public Employees Retirement System, for building construction, and for federal food assistance — all funding that Kansas lawmakers have little choice over, and funding that does not pay for classroom operations. Some like to add all of that up and say, “See, school districts have plenty.” But that’s a cover-up for what is happening at the heart of the system, and an attempt to make us look away from the real issue. 2) Under current policies, the future will be worse. The Kansas revenue stream has been cut so severely that it does not even cover school finance at present levels, let alone allow for classroom growth. The state’s bank balance is being drawn down to pay expenses that are hundreds of millions above income. But the bank balance will soon be gone. Spending in the current FY 2015 state budget needs to be cut back. Even greater spending reductions will be required to balance the budget in the next fiscal year as additional income tax rate reductions kick in. The budget situation has the state hamstrung. In truth, Kansans, we have a growing problem right at the heart of our education system. The Kansas Legislative Research Department (KLRD) has released updated budget numbers. We now know exactly what happened in fiscal year 2014, and have confirmation of the very difficult financial situation ahead. But remember, the FY 2015 revenue estimate is far too optimistic. The FY 2015 revenue estimate was set last April with incomplete information. The estimate forecasts growth of $321 million over actual FY 2014 receipts. In July, the first month of FY 2015, receipts were already $31 million lower than the previous July. Not a good start. What if receipts in FY 2015 only equal the receipts received in FY 2014? Then, before this fiscal year is over, the state will need to cut approved spending by $292 million just to keep the State General Fund solvent. Imagine the bright side for the moment. Imagine that receipts do come in as predicted and the state ends FY 2015 with $29 million in the bank. What does that then mean for FY 2016? Expenses will be growing just to cover new Medicaid costs and required increases for the state retirement system. Revenue will at best be flat as even more income tax rate reductions kick in. 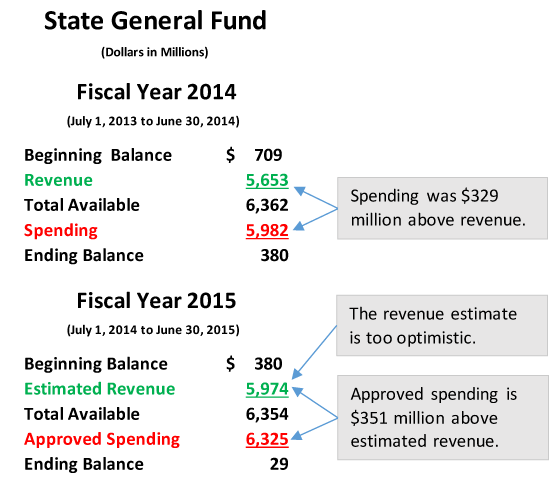 KLRD predicts that lawmakers will have to cut $238 million to keep the SGF balance above zero. Again, that’s the optimistic scenario. The KLRD profile shows that if Kansas stays on the present course, the state will have a $1.3 billion negative balance by the end of FY 2019. However, the state cannot let the SGF go below zero, so something must give way. Kansans, we have to face a hard reality. The governor’s tax plan has torn up the budget. The problem is coming fast and hitting hard. Education and key state services are in great jeopardy. * Last month the state budget director reported a FY 2014 balance of $434 million, but without any of the supporting revenue and expenditure information that KLRD now provides. As it turns out, that reported balance figure was only “cash-on-hand” and did not take into account encumbrances—essentially, checks written but not yet cleared. ** The FY 2015 approved spending amount includes expenditures of $24.1 million that have “shifted” from FY 2014 to FY 2015. The spending was approved for FY 2014 but was not spent—perhaps because a construction project was behind schedule or some similar reason. 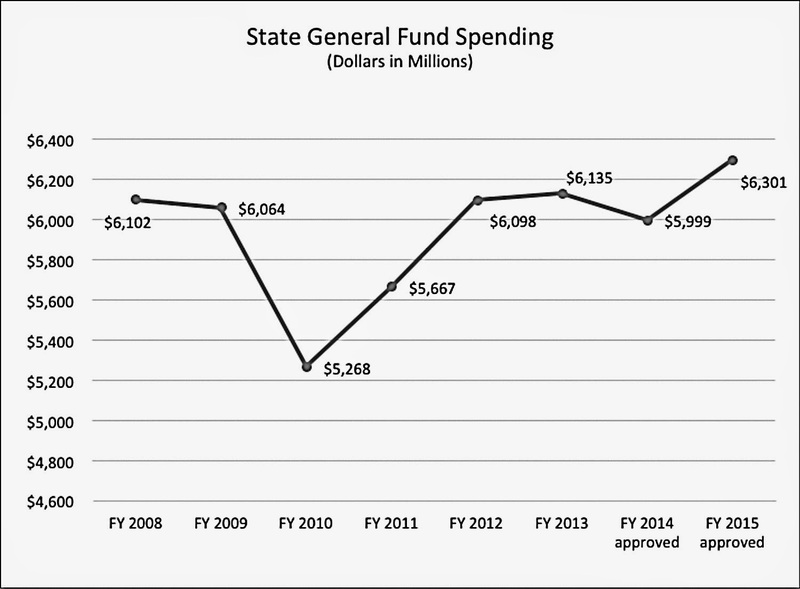 Although not spent in FY 2014, that spending authority has shifted forward to FY 2015. *** State law requires the ending balance to be 7.5 percent of expenditures. With spending set at $6.325 billion, the ending balance should be $474 million. Lawmakers exempted themselves from the ending balance law for FY 2015. Funding for public education in Kansas is in big trouble! Costs for supplies, electricity, transportation, and teachers’ salaries are all increasing. But for the coming academic year, schools must cover those growing expenses with $548 less for each student than they had 6 years ago — 6 years ago. And the state’s grim financial situation imperils any prospect for improvement. 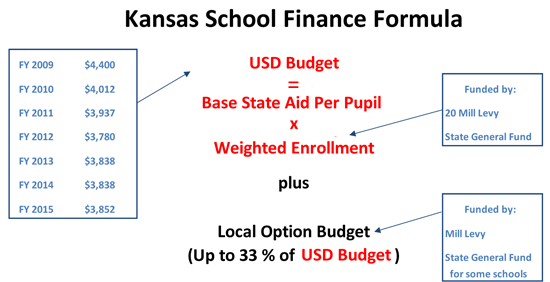 The Kansas school finance formula may seem complicated on the surface, but the key calculation is easy to understand. At its root, a school district’s budget is determined by an amount per pupil multiplied by the number of students. School districts can then add on a “local option budget” of up to 33 percent of the basic budget. Schools must run their classrooms and education programs within that total. In the 2008/2009 school year, school budgets were based on a per pupil amount of $4,400 — the high point for school finance in Kansas. For the upcoming 2014/2015 school year, lawmakers budgeted $3,852. School budgets are financed by a combination of state funding and local property tax funding. A change in either state funding or property tax funding affects the per pupil amount. The per pupil figure has dropped because state funding has dropped. Yes, school districts also receive funds for to pay for other things: the Kansas Public Employees Retirement System (KPERS), special education, school building construction, capital outlay, food service, etc. However, that funding must be used for its intended purpose. In fact, in most districts, special education aid does not cover the full cost of providing services and must be supplemented from the district’s general budget. Most notably, the cost of the employer share of school employee KPERS contributions has increased dramatically as the state works to repair an underfunded retirement system. The state sends funding to cover the KPERS expense to school districts, and they in turn send it immediately to KPERS. The KPERS funding makes it look like the state is putting more money into schools, but it’s a so-called “pass-through.” That increased funding does not pay the electric bill or a teacher’s salary, for example. 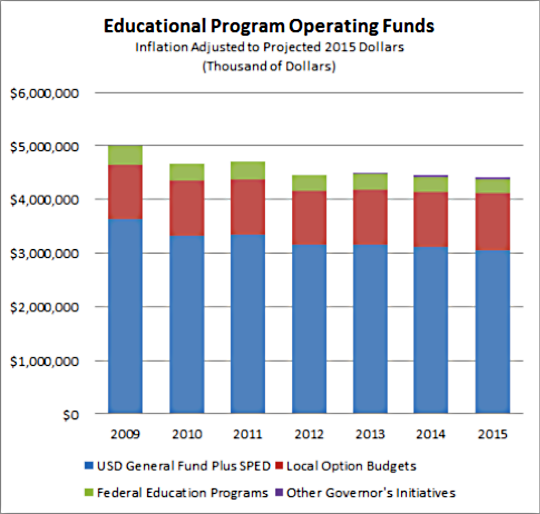 Is the state in a position to add money to push the per pupil amount up? Definitely not. In fact, the $3,852 per pupil budgeted for the upcoming school year is probably unreachable given that midyear cuts likely will have to be imposed on the FY 2015 state budget. For the year following, Kansas faces a situation in which the state’s expenses — without any increase for school finance — will be hundreds of millions higher than revenue. The state’s bank account will be empty and unable to make up the difference. The fallout from the governor’s tax plan has made investment in Kansas public schools impossible. At best, the state can only tinker with school finance, which leaves two options: more funding from property taxes, or more school district cuts. That’s not a recipe for progress.